This week the merch world is shaking things up with lots of type-themed releases, limited campaigns, and lots of adorable plush. 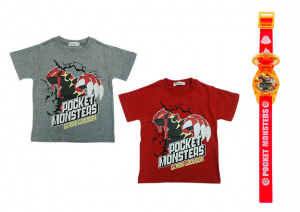 While only a few things saw release this week, a lot more things have been announced in the lead-up to the July merch-fest that is the Pokemon Movie. So without further ado, lets dive right in! 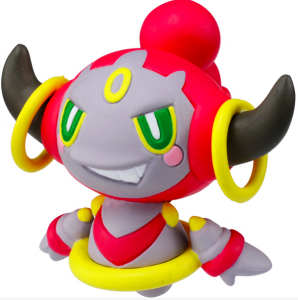 • Tomy Plush Announcements - Talking Hoopa! • Pokemon Gachakeshi XY Movie 18 Ver. • Monster Ball Stamp XY Movie 18 Ver. 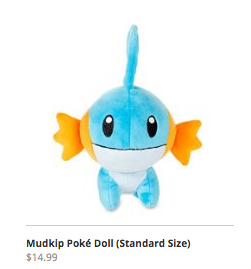 It looks like the trend of the Japanese Pokecen Originals being released stateside is continuing, as Pokemon Centre USA added Gulpin, Kirlia, and Sableye to their line-up. These three were originally released on the 8th of November in Japan. The US versions have an RRP of $12.99. 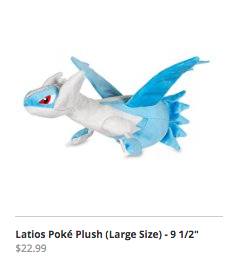 Looks like more and more plush are making it stateside! The Secret Base Pokedolls that were released last year in Japan now have US versions. The only difference will be their hang and tush tags. The US versions have an RRP of $14.99. 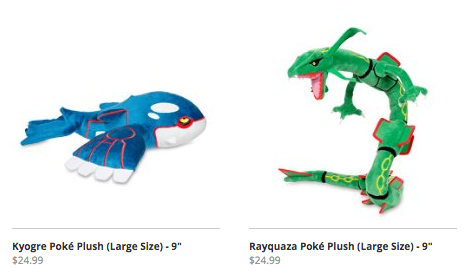 All the ORAS Legendaries who have Pokecen Original plushes now are available stateside, with the lineup including Rayquaza, Kyogre, Groudon, and both Latis. 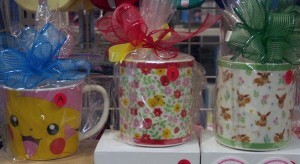 The Weather Trio have an RRP of $24.95, while the Latis RRP is $22.95. Kotobukiya in Akihabara have opened up a special Pokemon corner in their main hobby store, featuring a number of goods — hard to tell at present how many goods are new or Kotobukiya originals, but they are touting that they’re offering special gift wrapping for goods upon purchase, and from what scouring I did to try and ID all the goods I can at least say they seem to be things that haven’t been stocked in some stores for a few months at least. 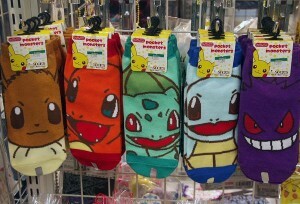 Kotobukiya are selling socks with Kanto favourites, stationary, Pikachu plushes, clear files, blankets, and really adorable small mugs with Eevee and Pikachu. New metal charms and metal straps have been added to the Pokemon Regional (Gotochi) line! The charms came out on the 13th of February, but only have officially been noted on the website. Included in the line-up are adorable charms like Osaka’s Pikachu with takoyaki, Hokkaido’s Pikachu with a wooden bear carving, Nagoya Castle, and even a Masamune Pikachu from Sendai! Each charm costs 300円 plus tax, and can only be obtained in the city/region they’re featuring. 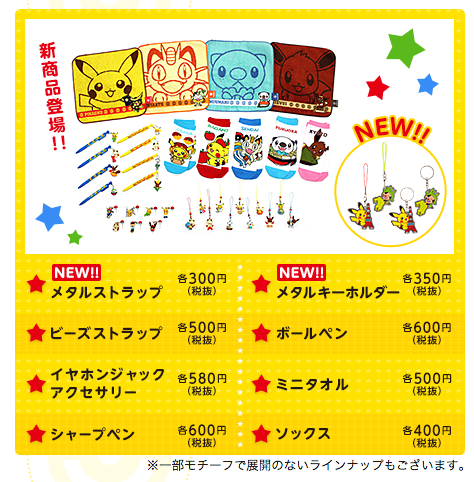 All previously released charms from 2014, such as Chespin holding a map of Kyushu, are being reissued in this new line as charms and straps as well. You can see the full line-up on the site! Starting from March 1st (it's so close that I'm including it in this weeks MMW), Daichi Pan will be distributing some new bread flavours of the Pokemon Pan series to combini and grocery stores. 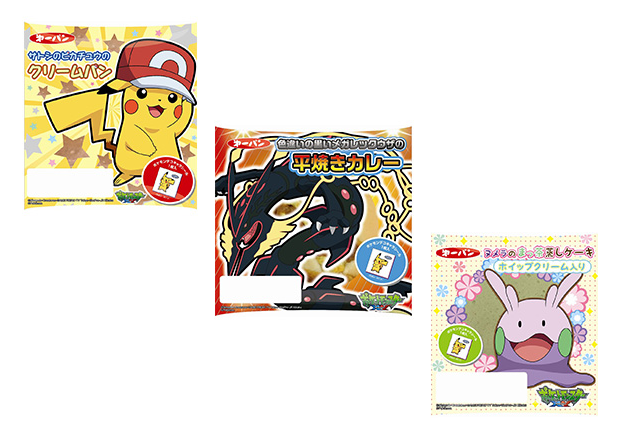 The three new flavours and packets feature Rayquaza, Pikachu, and Goomy! Shiny Rayquaza is a savoury Roasted Curry flavour, Pikachu is Cream-filled flavour, and Damono Goomy is steamed Tea Cake. Each pan comes with a random deco-chara seal. You can see the current seal line up here! 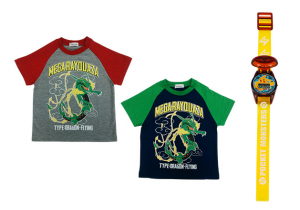 Takara Tomy Arts have brought out another range of kids wear, this time featuring the Primal Reversion mons, Mega Blaziken, and Mega Rayquaza. There are two different colours available for each set, and they all come with a matching kids watch -- or in the case of Mega Rayquaza, a Pikachu watch. Because Mega Sky Snake is too good for watches it seems! Each set costs 1,300円 pre tax and should be out in stores like Toys R Us and department stores, and sizes run from 100-130cm. In addition to the huge roster of figures for Moncolle that were listed last week, a few more have cropped up, including the first issue of Arceus since 2009, and Hoopa’s first Moncolle. 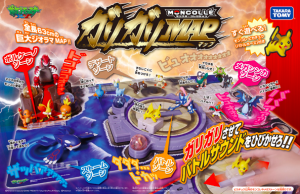 Likewise, the June Spinner set lists a ‘Hyper Size Moncolle’ and a ‘New Pokemon Moncolle’. How exciting! 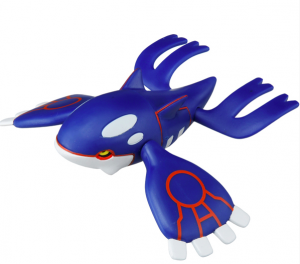 As part of the on-going ‘Black Rayquaza Campaign’ that starts officially on the 14th of March with the release of Emerald Break and the kick-off of the Rayquaza Mega Battle, a number of products are releasing shiny versions of Rayquaza and Mega Rayquaza. 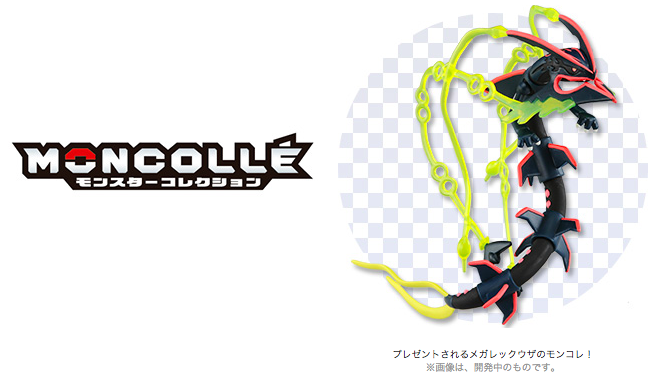 Tomy’s Moncolle series is one of the product lines kicking things off with a Shiny Mega Rayquaza Moncolle. There will be 1,000 figures awarded as prizes. To enter you have to purchase 3 various Moncolle products and mail the barcodes into Takara Tomy between the 14th of March through to the 31st of July. Winners will be drawn in August. Two new PitaPoke playsets have been listed by Takara Tomy after a bit of a dry-spell in the series: Fluffy Sky Park and the PitaPita Pokemon Centre. 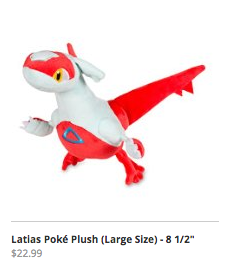 Fluffy Sky Park will have Latias and Latios and will retail at 2,160円, while the Pokemon Centre hasn’t got a roster of Pokemon yet. It also retails for 2,160円. Both of these sets will be released on June 20th. Tomy Plush Announcements - Talking Hoopa! 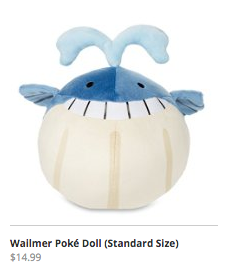 Oh boy have Tomy listed some nice things this week. 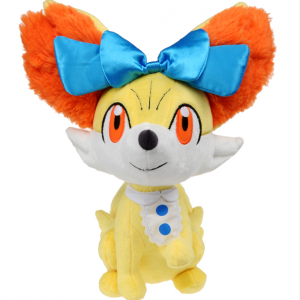 To begin, we’ve got the Doridori Fennekin, based off of Fennekin’s appearance in the Doridori ED of the anime. Doridori Fennekin is 25cm tall and utterly adorable, and is expected to be quite popular as Tomy only have a limited pre-order window that ends on March 18th, a few months ahead of the release given it’s not due out until the 29th of May. You can check out the rest of the announced products below — unfortunately there are no images yet. 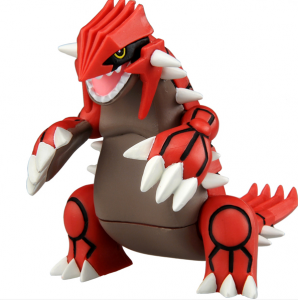 The latest Pokemon Kids figure set has been announced with a pretty awesome line-up of mons coming in the April block. Like prior sets there is a focus on Mega Pokemon, and we’re starting to see new casts/poses for older mons start to appear. The line up for this set consists of Mega Rayquaza, Mega Latios, Mega Salamence, Mega Heracross, Mega Scizor, Braxien, Aromatisse, Sliggoo, Goodra, Trevenant, Wartortle, and Raichu. This set will come out April 25th. 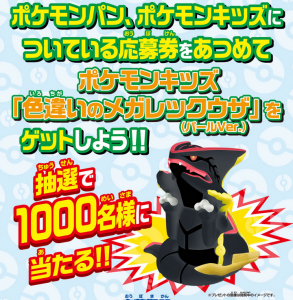 Starting from the 6th of April through to the 30th of June, Bandai are holding a joint campaign with Daichipan for a Shiny Mega Rayquaza campaign, where a pearlescent coated Shiny Mega Rayquaza kid figure will be given to 1,000 successful entrants. 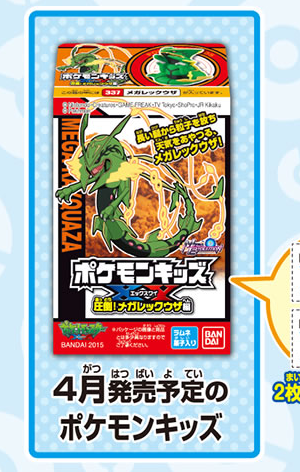 To enter, you’ll need 1 entry seal from the March-April Pokepan bread releases, 2 seals from the Mega Rayquaza Compilation set mentioned above, and 1 final seal from the 41st issue of Pokemon Fan on the 18th of April. Finally, a Pikachu has to be drawn on the entry form. Campaign winners will be drawn in July. Ensky, the merch producers who we all love to hate because of their janky distribution, have a new range of Keshipoke figures coming out that we can all love (and hate equally because of said distributions) and adore. The line up for this set consists of Pikachu, Hawlucha, Amaura, Litleo, Tyrunt, and Carbink, with one secret figure that’s not yet currently known. Pokemon Gachakeshi XY Movie 18 Ver. 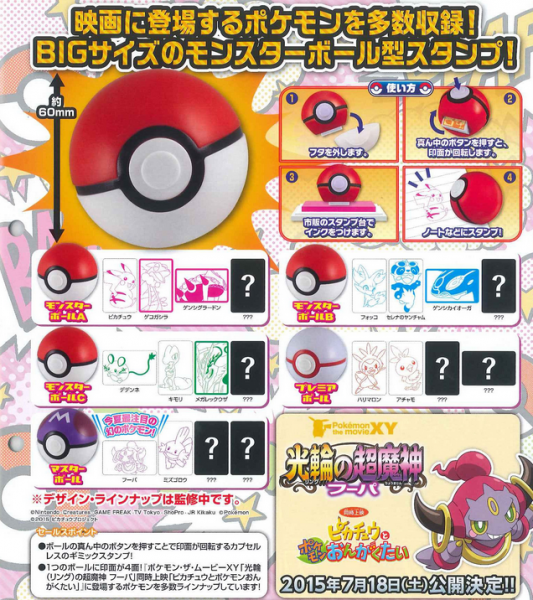 More Hoopa merchandise is emerging in the lead up to the July movie! 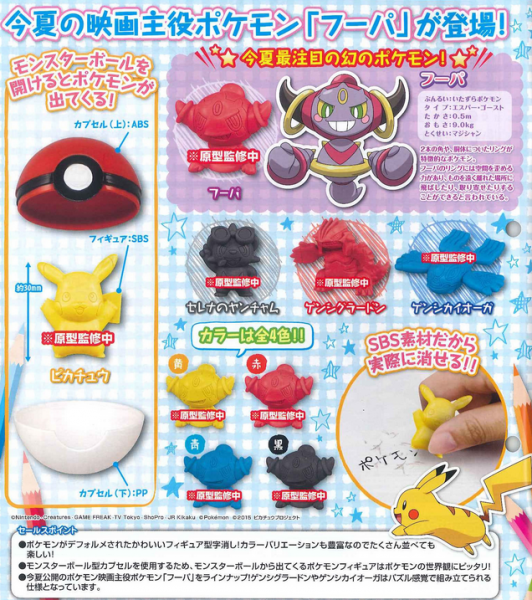 This time Takara Tomy Arts is bringing out a gacha series of erasers complete with Pokeball capsules. The line up has Pikachu, Serena’s Pancham, Primal Groudon, Primal Kyogre, and Hoopa. 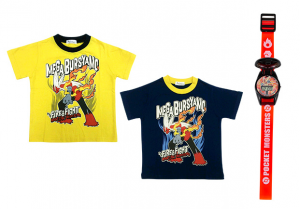 Each comes in one of four different colours: yellow, red, blue, and black. 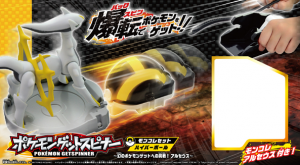 This eraser set will hit gacha machines in May, and will cost 100円 per try. Monster Ball Stamp XY Movie 18 Ver. Along with the Gachakeshi release, Takara Tomy Arts are releasing a Monster Ball Stamp series in May in gacha machines. The Monster Ball stamps are quite large at 60mm, and there will be 5 different versions available — three different Pokeballs, a Premier Ball, and a Master Ball. Each ball has four different stamps that can be rotated between. Pokeball A: Pikachu, Frogadier, Primal Groudon, ??? Pokeball B: Fennekin, Serena’s Pancham, Primal Kyogre, ??? Pokeball C: Dedenne, Treecko, Mega Rayquaza, ??? Premier Ball: Chespin, Torchic, ?? ?, ??? Master Ball: Hoopa, Mudkip, ?? ?, ??? The stamps will hit gacha machines in May, and will cost 200円 per try. 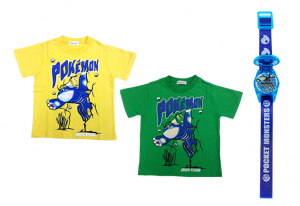 Need some Pokemon love in your bathroom, or during your visits to the pool or the beach? Well, Banpresto have you covered. 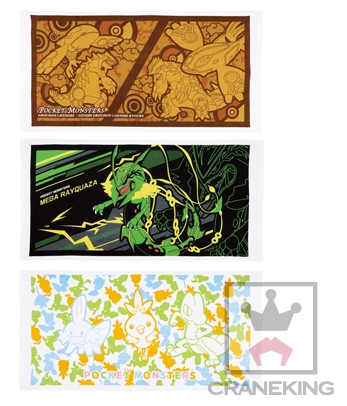 Three large size (60x120cm) towels will be distributed in crane machines next month in three designs: Groudon/Kyogre + Primal Reversions, Mega Rayquaza, and the Hoenn Starters. These towels will hit machines on the 5th of March! 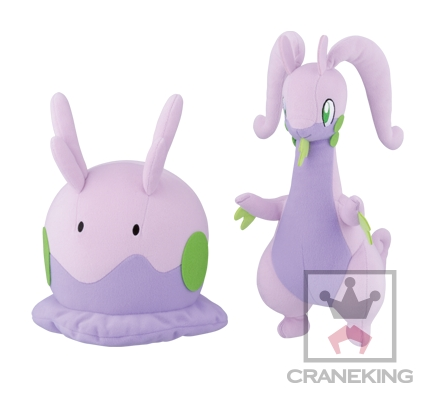 March is dragon-type madness in merch, and it’s kicking off adorably with two new plush coming out in the Super Deluxe range from Banpresto: Goomy and Goodra. They both come in at around 25cm each, and look incredibly snuggly. These plush will hit machines on the 12th of March! 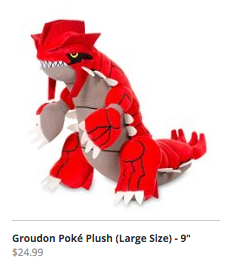 Continuing the dragon-type trend is the latest release of My Pokemon Collection mascot plushes. The line-up for this set consists of Goomy, Goodra, Dratini, Dragonite, Gible, and Salamence — for some like Dratini and Gible these are their first plush made. These cuties will hi machines on the 12th of March! 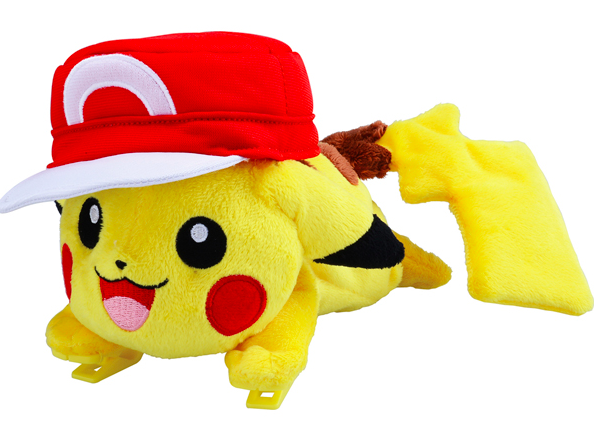 Sekiguchi are releasing two adorable looking Pikachu plush in April. 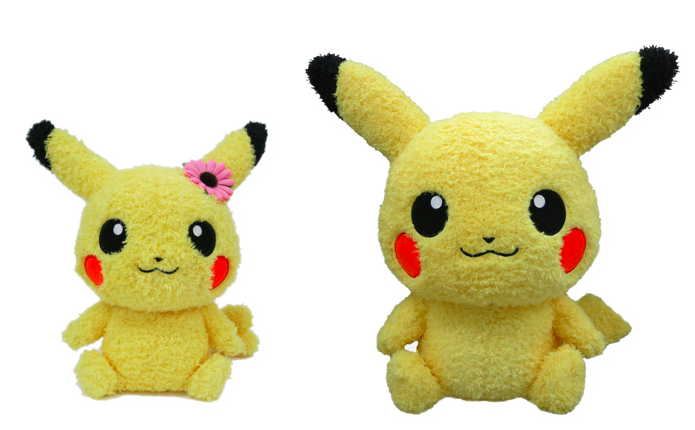 One is a female pikachu, complete with heart-shaped tail and a flower behind her ear, and the other is a XL sized Pikachu. 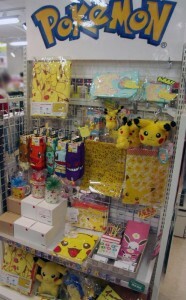 The female-chu comes in at 2,600円, while the significantly larger Pika will cost 12,000円.